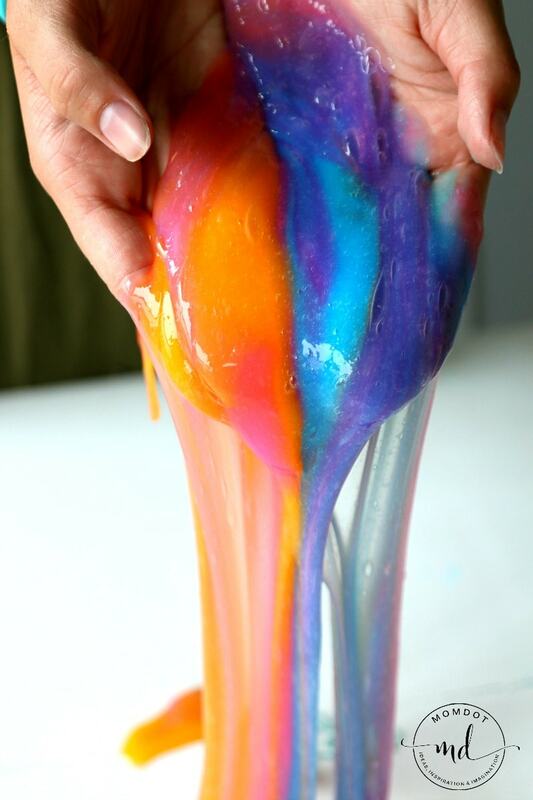 A few years ago we created unicorn poop slime and everyone really loved it. 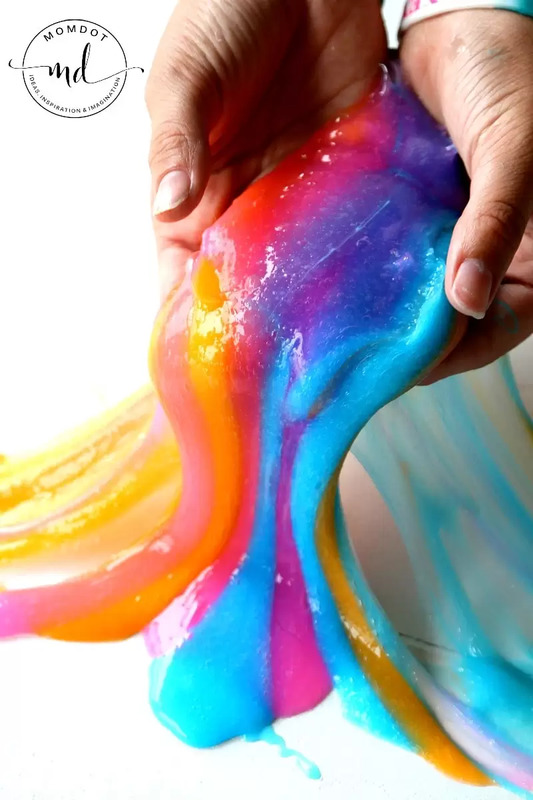 Since then, MomDot has been on the forefront of creating and inspiring you out there to enjoy slime in a sensory and creative fashion with awesome new slimes like Kinetic slime (holds shape) and Rainbow Explosion to old favorites like 4th of July Slime and Pot O Gold Slime. Recently Charlotte and I have also been exploring new and creative ways on how to make slime and to play with our slime recipes like Slime Painting! No matter what slime you make or how you enjoy playing with it, having new and beautiful colors and textures makes it worth the mess. I swear. 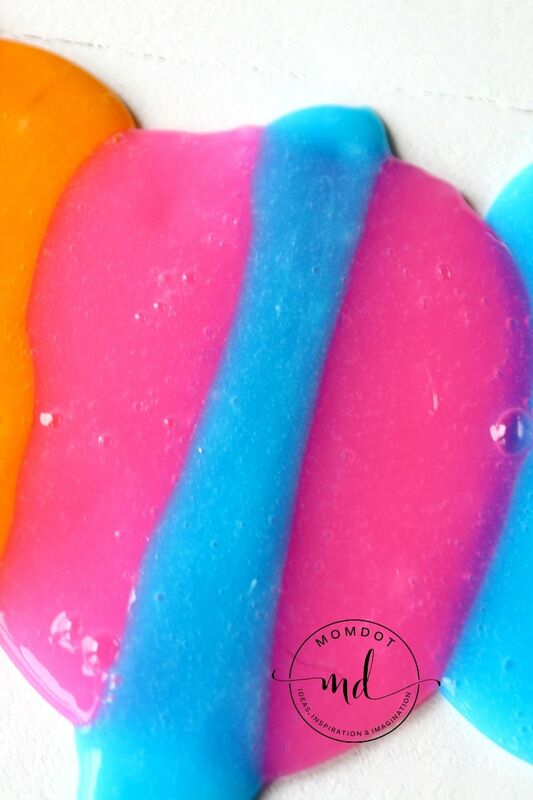 Love the Slime Recipes on MomDot? Our first book has been published and you can pick up a copy right on Amazon for yourself or to gift to a slime fan in your house! It features not only some fun basic slime recipes and how to get started on creating your own, but also some ways to use slime for holidays and gifts! Check out the book here! 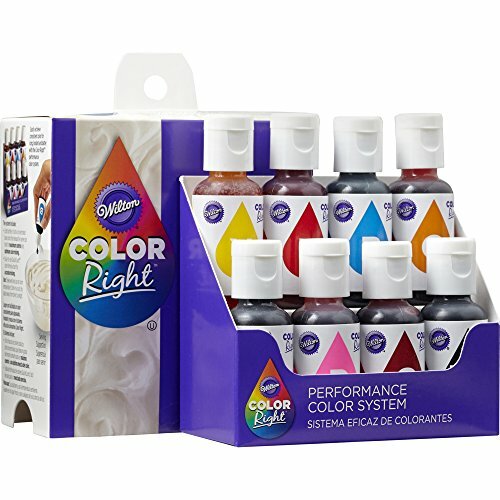 Food Dye – I only use Wiltons Color right because it has produced a consistently beautiful slime for us- to get colors like this I recommend it. NOTE BEFORE WE GET STARTED: First when it comes to slime, please know that its a science project. It shouldn’t be done with really tiny children or kids that put things in their mouths. Maybe dyed spaghetti is better for the little’s. 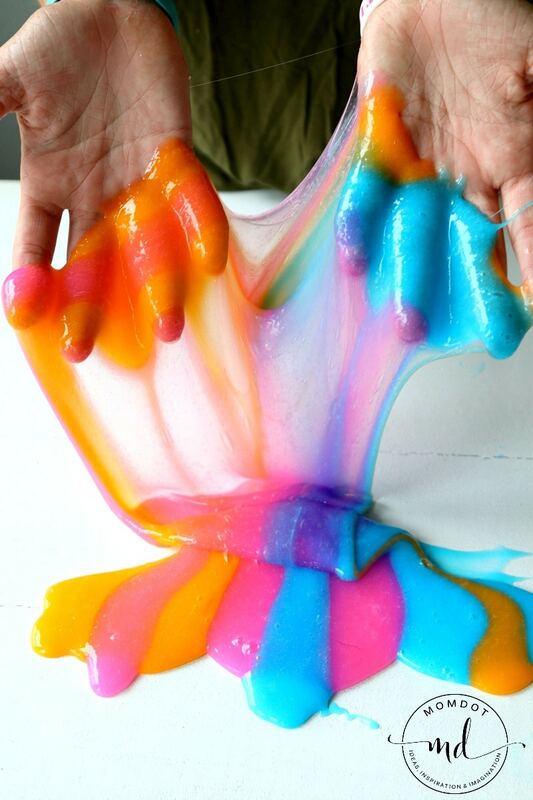 At the end of the day, slime is a fun project but also one that you should create with caution. Remember that if you have sensitive skin to use gloves. To create this clear glue Unicorn Poop Slime Recipe, you will need to do the same thing as always- mix your glue and your starch . 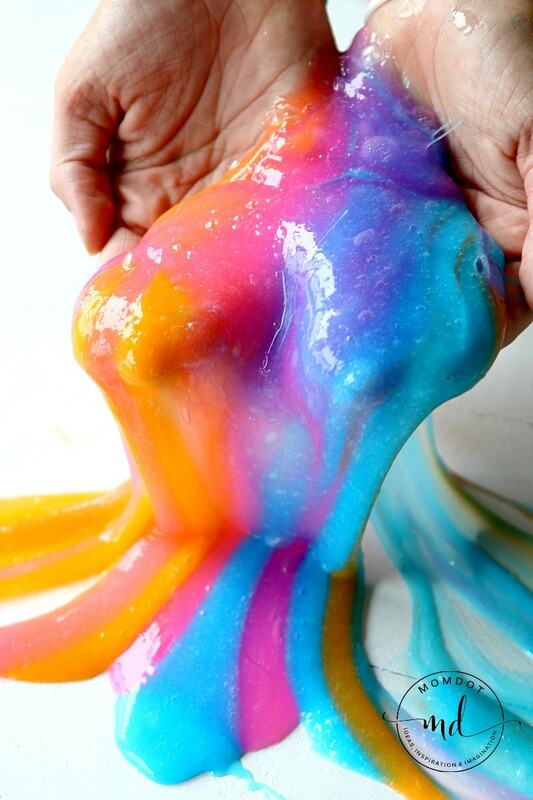 If you are used to making slime in general, this is pretty easy for you but when it comes to clear glue, it typically needs double the amount of starch to cling together. I am not giving exact measurements because it mostly depends on how much slime you want to make. We typically pour in about a cup of glue, then add your colorant, and then a cup of starch when it comes to clear glue. 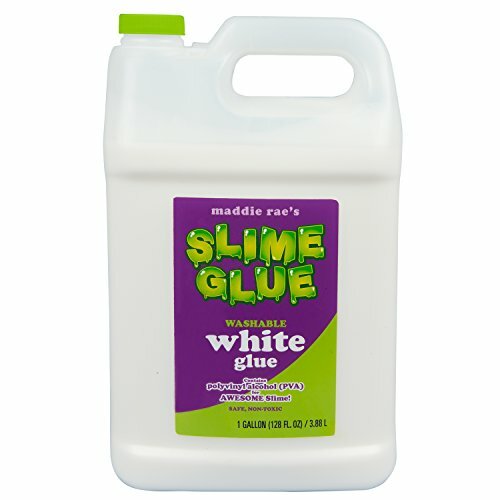 Again, when you use CLEAR GLUE, it will have a faster flow and will not work like regular hard glue slimes. The point is to leave it super flowing! I like to use a spoon first till it starts to stick together and then knead it to finish. IMPORTANT STEP: Kneading is half the battle of getting the slime to stop sticking. If you knead for about 2 minutes and its still, well, everywhere, you need to pour in some more starch. Its just that simple. Be amazed as your slime starts to form up! Now create 2-4 separate color batches and lay down in stripes to play! Of course if you mix colors, eventually it will all fold into one color and for us, that is typically purple or blue.